New York-based violinist, Miki-Sophia Cloud, enjoys a rich musical life as a recitalist, chamber musician, orchestra-leader, and innovative artistic director. As a soloist and recitalist, she has appeared at Boston Symphony Hall, the Kennedy Center, on NPR, and on ORF, Austrian National Radio. Since 2009, Cloud has been a core member of the self-conducted chamber orchestra, A Far Cry, where her leadership as Concertmaster and soloist have been acclaimed by the New York Times and Boston Globe. Behind the scenes, she directs the ensemble’s community partnerships and educational programs. An active orchestra-leader, Cloud is also co-concertmaster of the Mozart Orchestra of New York. Passionate about chamber music, Cloud is a member of the Solera Quartet, New York Chamber Soloists, and first violinist and artistic director of the White Mountains Music festival, a six-week chamber music festival in Northern New Hampshire. An acclaimed artistic director and creator of adventurous and insightful programming, Ms. Cloud's concerts have been hailed as "ingenious" by the Boston Globe. Dreams and Prayers, the first album she developed for A Far Cry was nominated for a 2015 Grammy award in Chamber Music, and the second, Law of Mosaics, was hailed by Alex Ross as one of the top ten albums of 2014 in The New Yorker. A graduate of Harvard College, and Yale School of Music, Ms. Cloud is currently a doctoral candidate at New England Conservatory. 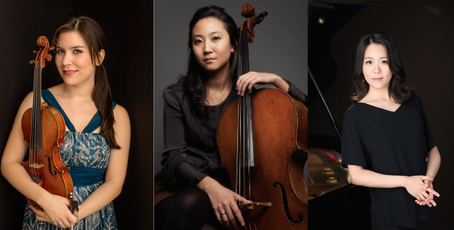 Cellist Jia Kim began her cello studies at the age of ten in Korea, where she has won first place in the Korean Music Association Competition, the National Symphony Orchestra Competition of Korea and the Young Musician Foundation's National Debut Concerto Competition. Since then Ms.Kim has taken the stage in cities across the United States, South America, Europe, and Asia, appearing in venues such as Carnegie Hall, the Metropolitan Museum of Art, Avery Fischer Hall, Chicago Symphony Center's Orchestra Hall, Miami's Arsht Center, Valle De Bravo in Mexico, Toronto's Royal Conservatory, the Walt Disney Concert Hall in Los Angeles, EJ Thomas Hall, The Korea Society in NYC, Barclay Center in Brooklyn, and Princeton University's Alexander Hall. Her performances have been broadcasted on WQXR, PBS and KMZT Classical, acclaimed by the New York Times, Vermont Today, South Florida Classical Review and the HamptonRoads among others. ​Ms. Kim is a recipient of numerous awards and scholarships including the Jack Smith Memorial Award, Most Promising Young Talent at the 2005 Pasadena Showcase House, the Performing Arts Scholarship from the Cerritos Center of Arts Education, and a full scholarship to the Crossroads School in Santa Monica and the Colburn School of Performing Arts. A passionate chamber musician and educator, Ms.Kim was invited to do a Visiting Artist Residency at the University of Hawaii and the College of William and Mary. Currently she serves as faculty at the Brearley School and New York Youth Symphony's Chamber Music Program as well being a dedicated teacher to her private students in NYC. Recently Ms.Kim was appointed the new Artistic Director of the International Music Sessions which exists provide students from different backgrounds with platforms to accept, collaborate, and to develop life skills through music. In 2003, her life changed forever at the Perlman Music Program and is evermore grateful to her mentors and teachers Ronald Leonard, Itzhak&Toby Perlman, and to Joel Krosnick, whom she studied with at the Juilliard School for a Bachelor and Master Degree in Music.